MasterRents is a locally owned rental house offering a wide variety of backhoe rental by the day, week or month. MasterRents has over 100 pieces of equipment and we offer delivery of your backhoe rental in Massachusetts at reasonable prices. We are located just 20 minutes north of Boston, Massachusetts. MasterRents is part of the Cat Alliance Rental Program which opens the door to a wide variety of equipment. MasterRents fleet of backhoe rentals provides outstanding versatility performing a variety of digging, loading and utility tasks. Backhoes are excellent tools for digging in the street because they can dig and back fill a trench and drive right over the road to and from a job site. Backhoes can be used effectively to dig the trenches used to lay pipes or install septic tanks. They are also very efficient for snow plowing. If your next construction job requires the use of earth moving equipment like a backhoe, then look no further than MasterRents, we will provide you with the backhoe you need to get the job done. If you’re looking for a backhoe this is built for greater reach, dump height, breakout force and pushing power MasterRents can provide the right John Deere or CAT backhoe you are looking for. 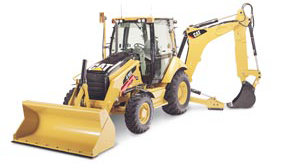 MasterRents also has backhoe attachments including hydraulic hammers, forks and snow pushers. MasterRents is here to help you with any questions you may have about our backhoe rentals or any of our other pieces of rental equipment. We have a full time salesman as well as a knowledgeable staff ready to assist you with any issues you may have. MasterRents offers short-term rentals at reasonable prices; please contact us at 978-762-RENT (7368) for more information. We look forward to serving all of your rental needs.